Floyd's article on disaggregated COT report. disaggregated COT article written by Floyd to Hedge Funds and Investment banking industry regarding modifications to the COT report. Floyd discusses the improvements resulting in greater market transparency via the disaggregated COT report (article starts on Pg #24). Read Floyd's article on these important changes to the COT! "Commitments of Traders: Strategies for Tracking the Market and Trading Profitably"
Commitments of Traders will teach you why the trading activity of commercial institutions—as evidenced in the COT report—is so valuable in analyzing particular markets. And you will learn how to leverage the COT with technical and fundamental analysis. A priceless moneymaking tool, Commitments of Traders is essential reading for anyone trading in the lucrative futures market. Stocks & Commodities publish review of Floyd's book! 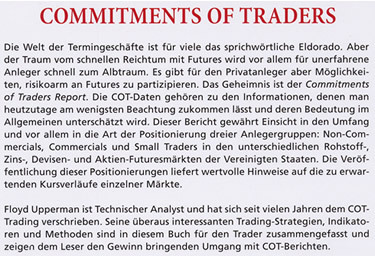 Read what the experts are saying about Floyd Upperman's best selling "Commitments of Traders!" It's not just a matter of hedgers vs. speculators. An engineer turned trader discusses ways to make sense of the futures Commitment of Traders repot. Floyd Upperman and his COT Report featured in Stocks and Commodities Magazine.